Since 2000, Thornton Dial (born 1928) has embarked on one of the most remarkable creative journeys in American visual art. Following his discovery by the art world in the late 1980s, he became in the 1990s a widely known African American vernacular artist. Coinciding with the turn of the millennium, Dial has spent the eighth decade of his life on overlapping cycles of epic-scale artworks that summarize the grand sweep of his improbable life’s story. Born in a cornfield to an unwed teenage mother, Dial grew up in rural Emelle, in Alabama’s western flatlands. He began full-time farm work at age five and managed to attend school only rarely. On the eve of World War II, he was sent to live with relatives in Bessemer, just outside Birmingham. There he married, raised a family, and worked for half a century in heavy industry, building highways, houses, and ultimately box-cars during a thirty-year stint at the Pullman-Standard plant. From childhood on, Dial built “things” using whatever he could salvage, recycling even his own work to reuse materials in new creations. Dial referred to what he made only as ”things,” though late in life he found out that others called them “art.” Having developed during the era of racial segregation, Dial’s style is both personal and culturally rich, and it speaks with a resolute voice that was denied him through the years as a black factory worker. In Dial’s art, intense surfaces, multilayered narratives, shifting compositional relationships, and a metaphysical concern with issues of recycling and ancestry exist hand in hand with an ironic, earthy wit and an almost religious determination to make art’s complexities and mysteries central to the human understanding of reality. 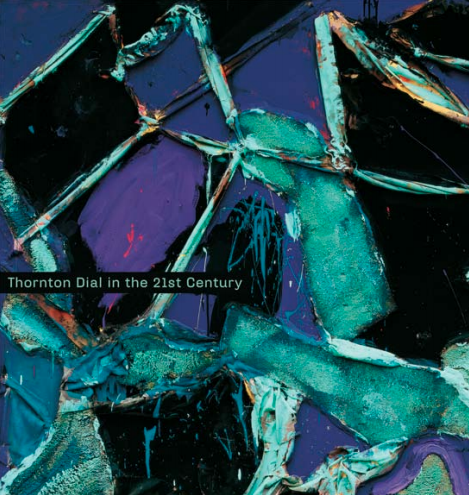 With illuminating essays by leading critics and art historians, an in-depth biography of the artist, and explorations of the southern black art traditions that underlie the artist’s visual vocabulary, Thornton Dial in the 21st Century maps new terrain for the study of American art. This lavishly illustrated monograph has been published on the occasion of a groundbreaking exhibition organized by the Museum of Fine Arts, Houston and the Tinwood Alliance. Thornton Dial in the 21st Century follows the artist’s explorations of interlinked topics, including a haunting suite of work about September 11, 2001; contemporary “history paintings” on life in America since the events of 9/11; homages to his friends, the women quiltmakers of Gee’s Bend, Alabama, their craft; a new type of “art about art” in which Dial responds to works from disparate cultural dialogues (including art by academically trained and vernacular artists); memories of vanishing ways of life and his childhood in the South; and evocations of human struggles for freedom. Reproduced here are 118 recent paintings and sculptures—virtually all of the artist’s output from this five year period—as well as nearly 30 works on paper and a rich overview of Dial’s work from before 2000. “It happens to every reviewer, once in a while: When least expected, you come across an artist whose work knocks you off your tracks and silences you, utterly….In this case, how can one describe the paintings and drawings of Thornton Dial, after meeting them for the first time?....What stands out is his torrential energy, and his uninhibited boldness of execution. With his instincts on fire he plunges headlong into the arena of creations.